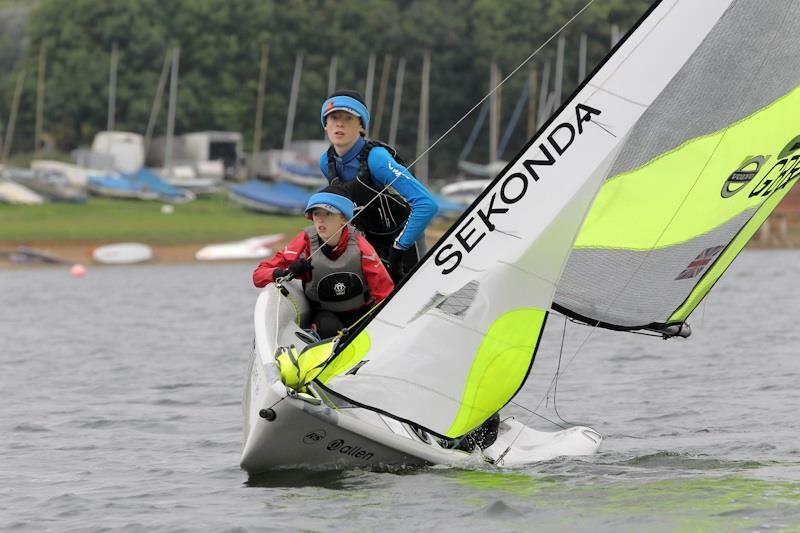 The RS Feva Inlands Championships had a new sponsor for 2014. Capita is a UK leader in business process management and outsourcing solutions. Rutland Sailing Club hosted the event with Stuart Childerley as the Race Officer. With a light wind forecast for the whole weekend the plan was for 4 races on Saturday. Racing got away in 5 knots of very shifty breeze. First start got away on a black flag after 3 attempts. However after 8 minutes racing the wind vanished and to the cheering of the fleet the race was abandoned. Finally some decent breeze came through and the fleet get away clean on a black flag in 7 knots of breeze. First at mark one was Lucy Greenwood and Nathan Loma followed by Archie Leckie and Harvey Leigh; 3rd Hannah and Maddy Bristow; 4th Will and Matt Taylor. By the end of lap one Team Taylor take the lead from Team Bristow. These positions held to the finish with Archie and Harvey in third; 4th James Hammett & Ben Todd; 5th Piers Nicholls & Freddie Peters; 6th Bradley Duffy & Bella Cox. Race 2 got under way in 5-6 knots of wind with a clean start on a square line. All day the only breeze was under the clouds so the PRO was quick to get a race started as soon as new wind came down the lake. The wind hung above 4 knots and the leaders have made it to the first mark. Will and Matt lead from Rory Odell & Josh Bonsey; 3rd Bethany & Freya. By the end of lap 1 in the 2nd race, Team Taylor still lead from Archie and Harvey; Jessie Main and Poppy Gilks moved up to third. But all change at the front! At the second windward mark Rory and Josh take the lead from the Taylors; 3rd Archie and Harvey. Following a very light last beat the breeze came down the run with the leaders making for some very tight finishes. Rory and Josh held the lead despite trying to beat to the finish line with the kite up! Will and Matt took second while Archie and Harvey were third; 4th: Jessie & Poppy; 5th James & Ben; 6th Luke Beuvink & Matt Clarke. The third race got away in 7 knots a big right shift made it a beat to the finish. Will and Matt win the race; 2nd Fin and Dan Armstrong; 3rd Ed Norbury and Charlie Hutchings; 4th Rory and Josh; 5th Piers and Freddie; 6th James and Ben. Unfortunately the forecast was correct & racing was abandoned for day 2. So positions stayed the same.